From Las Vegas, St. George or other points south on Interstate 15: Travel north to Exit 16, State Route 9. Follow State Route 9 east for 32 miles to the south entrance of Zion National Park. Once you enter the park, take the second right into South Campground, turn right at the bottom of the incline toward the campground. From Salt Lake City, Interstate 70 or other points north on Interstate 15: Travel south to Exit 27, State Route 17. Follow State Route 17 for 6.1 miles to State Route 9. Turn left onto State Route 9 and drive 23 miles to the south entrance of Zion National Park. Once you enter the park, take the second right into South Campground, turn right at the bottom of the incline toward the campground. From Bryce Canyon National Park, Panguitch or other points north on U.S. 89: Travel south to State Route 9. Turn right and follow State Route 9 west for 13 miles to the east entrance of Zion National Park. Continue straight for 12 miles, turn left into the South Campground, turn right at the bottom of the incline toward the campground. This campground was great for us! Large campsites, ours held our car and an 8 person tent with plenty of room to cook, hang out, and kick a soccer ball around. Bathrooms are clean and drinking water is cold! It's also GORGEOUS with amazing views of The Watchman from the site and two hiking trails next to the campground. Be sure to book online ASAP (2 weeks in advance is the earliest allowed) because these sites fill up super fast. Stayed here in the winter and had a lovely time. The park was pretty empty, and this gave me a chance to explore so many great areas, including The Narrows, with limited interruption. Highly recommend Zion in the winter! Went to Zion for the weekend to hike the narrows and hidden canyon. This time around, we decided to camp at one of the established campgrounds. Pros: located near the entrance, therefore convenient. Cons: have to book weeks ahead of time, there’s a $20 a night fee, and a sea of people, therefore no privacy. Sites available online 2 weeks before the date of your trip. Can reserve 3 nights at a time, max. $20/night for basic tent set up. Plumbed/flush toilets, accessible water spigots, clean facilities. No showersI had decent cell signal with Verizon, my friend struggled a little with T-Mobile but still had some. So close to the first shuttle stop, visitor center, and virgin river. Gorgeous view of the Watchman as you wake up. Walk-up sites have reserved parking spots. High was 105 during the day, didn't seem to cool off til about 2am each night, but was nice and windy at night. Also pretty close to the nearest town (Springdale)--maybe a five minute drive from the campground? We hiked the subway, the narrows (top down, one day), lower emerald pools, canyon overlook, observation point, and hidden canyon. Everything was beautiful! The rangers were so lovely and helpful as we made our hiking plans. Angels Landing is closed indefinitely due to a storm earlier this summer but that's just an excuse for us to come back next year! P.S. Campsites sell out FAST online. Set an alarm for 14 days before your trip and book first thing in the morning! Zion National Park is a very busy NP with limited campsites within the canyon proper, so scoring a campsite inside the park is tricky and fairly difficult to plan for. The first time we visited Zion we stayed in the South Campground, back when it was a first-come first-served campground. I heard you can now make reservations for South two weeks ahead of time, but I imagine the spots fill up as quickly as ever. If South campground still offers sites on a first-come first-served basis like its neighboring campground, Watchman, arrive in the park EARLY! Like 5-6am early! Lines for the campgrounds begin forming around 5 or 6am, and grow quickly. When we first stayed in Zion at the South campground, we timed the road trip so that we drove to Zion in the middle of the night in order to arrive early enough to get in line for South or Watchman campground. Both South and Watchman has had lines 20 cars deep by 6:30 am whenever we have camped inside Zion National Park, so be prepared to get up early to wait in line - I would also suggest having a back-up plan just in case you do not get a campsite in the canyon. Anyhow…South Campground is inside Zion National Park, adjacent to the visitors center (towards the entrance to the park). The campsites are small, crowded, and very open to neighboring sites - but with that being said, they are still very nice sites, and you can’t beat the backdrop of Zion canyon. Each site has a fire pit and picnic table, and plumbed bathrooms and water spigots are available throughout the campground. There are no showers in South campground - there are showers (for a RIDICULOUS amount of money) are located a short walk away in the “village” area, where there are also shops, restaurants, rentals, etc. The Virgin River runs adjacent to the campground - it is lovely to swim in when you are visiting Zion in the hot summer months. There is little to no cell reception in the campground - I use Verizon, and could occasionally get a signal in the campground. The signal was a little better in parts of the village. There are no bins for food storage in the campground - I do not know what kind of animals frequent the campgrounds in Zion Canyon, but I would still suggest locking all of your food inside your car at night. The visitors center and shuttle station are only a couple minutes away by foot - literally. Much of Zion is inaccessible by personal vehicles, so one must take the shuttle service to get around. The shuttle services are fast and efficient, but there still might be some wait time due to the popularity of the park. The shuttle announces what hikes and sites are accessible at each stop, but it’s good to look at a map and plan where you want to go ahead of time - the different hikes throughout the canyon are pretty spaced out, you don’t want to get off at the wrong shuttle stop. Zion Canyon can get VERY windy at night - every time I have camped in Zion National Park the winds have howled all night long, from around midnight well into the morning. If you have the option of bringing a tent with a low, sleek profile, I would highly suggest it. The first time we camped in ZNP we brought our large tent, and the wind really whipped it around all night. We used a small backpacking tent for our next trip, and the lower profile tent made less noise in the wind. The backdrop to South Campground is simply gorgeous! It is in the middle of the canyon, so you are surrounded on either side by tall red cliffs that glow like embers in the morning and at sunset! Surreal! 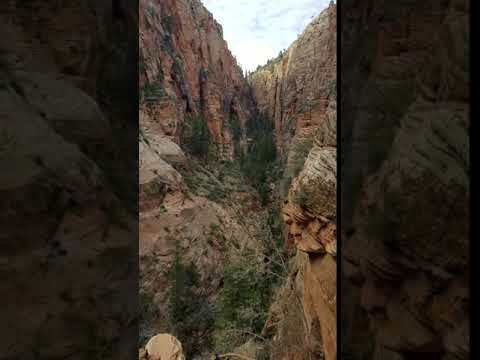 On this trip we hiked to the lower and upper Emerald Pools. The Emerald Pools hikes are fairly easy hikes, one mile for the lower pool, than an additional mile to the upper pool. The hikes are easy and moderate, respectively. On this trip we also went tubing down the Virgin River - SO MUCH FUN! We rented the tubes for $20 at Zion Outfitters, a rental shop right outside the entrance to ZNP. 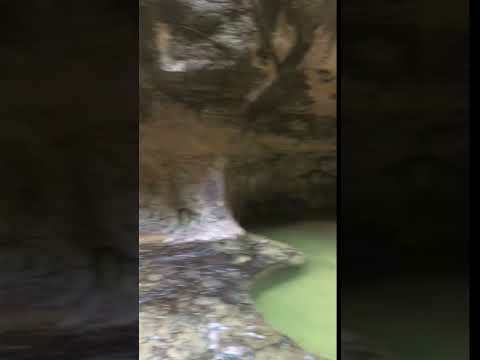 The trip down the river took about two hours, and was a very unique and relaxing way to experience Zion canyon! I will admit, even though it was really hot when we went, I was freezing for the last half hour or so of the float - the Virgin River is always cold. Besides that, I would highly recommend tubing down the river! TIP: If you have a pair of water shoes/sandals, I would recommend wearing them while tubing! I love South Campground when I go to Zion. Recently, they switched over from First Come First Serve to a 2 week reservation system ($20/night) so be aware of this when you want to go. You can check for cancellations, which is how I got in the last time at the last minute. You can't beat the views at sunset, you get to look up at the watchmen and be in awe. It is worth one morning doing the Watchman overlook trail, and also pulling your camping chair into the virgin river behind the campground after a day of hiking and walking.